The last thing the world needs is another rock star singing standards. Rod Stewart earned himself another few hundred years in purgatory with his multi-volume take on the Great American Songbook. The only thing wrong with the Tony Bennett/Lady Gaga duet album was... Lady Gaga. When even Paul McCartney's stab at the classics turns out to be nothing more than a tasteful snoozefest, you know it's time for the rock crowd to give it up and go back to electric guitars and raised-fist choruses. So why am I excited to write about the upcoming show by Micky Dolenz, formerly of the Monkees (well, currently too, given how often they reunite), in which he sings Broadway hits and, yes, standards? It's not because I'm a certifiably nutso Monkees fanatic. Well, OK, that's part of it. But Dolenz, before he was a member of the Prefab Four, was an actor. The child of two actors before him, both of whom were singers. And after the Monkees, he acted in Broadway musicals including Aida and Hairspray. In fact, his tenure in Aida lasted longer than the Monkees' original run. So this isn't a case of Michael Bolton throwing on a tux and making like a histrionic Sinatra. This guy know how to belt 'em out. Micky Dolenz, crooner, in rehearsal for his upcoming shows at 54 Below. And belt 'em he does, in his upcoming series of shows at 54 Below in New York. There's something for everyone -- Monkees hits like "Last Train To Clarksville," obscurities like the gorgeous Carole King-penned "As We Go Along" (a flop B-side from 1968), and standards such as "But Not For Me," all performed with a crack four-piece ensemble, plus Micky playing occasional guitar. But the highlight for me was the show tunes, ranging from "Don't Be The Bunny," from Urinetown, to "Mr. Cellophane" from Chicago. The guy's an amazing actor, and he emotes the hell out of these tunes. He's a little bit of a ham, on the over-the-top side, to be sure, but in a cabaret setting, it works. Oh man, does it work. 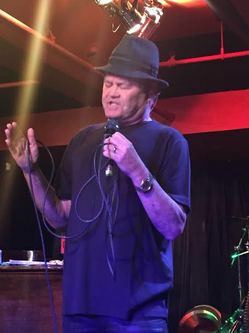 Micky Dolenz can get away with singing whatever the hell he wants at this point because, at age 70, his chops are still in prime shape, as I can attest from the rehearsals for the show for which I weaseled my way in. There are a lot of singers who can still shout to the rafters in their golden years, but singing softly, that can be rough. Listen to Sinatra or even Tony Bennett try to tackle a soft ballad in their later years -- there's a fair amount of creaking and croaking going on. But Dolenz's voice was at its peak for "Some Enchanted Evening," which he crooned in a near murmur that sounded closer to his Monkees-era voice than anything else he did that night. How does he do it? I'm convinced there's some sort of vocal version of Dorian Gray going on, and a 30 year old somewhere is wandering around sounding like Jimmy Durante. Micky is playing three nights (July 7, 10, and 11) at 54 Below. If you're a fan of the Monkees, or cabaret, or you just want a fun night out, it's not to be missed. But just in case you do miss it (for reasons beyond your control, I get it), the shows are being recorded for a live album to be released later this year. Be on the lookout for it.